System maintenance, preparing to put 4.0 online. $NYXBT (Bitcoin), signals = brief hiatus, waiting for the next iteration of the formulas. Expect to resume in less than 2 weeks. Model notes: Working on v4.0. My general rule is if 50% of model is being affected by the revisions, I move to the next whole number. I continue to struggle with falling out of synch with the market. My goal is to be using mathematic models to even view (or be alerted to) even “secret” or “insider” announcements that have not been revealed to the public next. 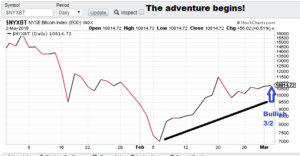 Awaiting Trend Signal ($NYXBT): Awaiting model 4.0. Should be complete in less than 2 weeks. Observation: We now have the new fee structure in place (check the l “Fees” tab for details). Get your independent research here, put my 25+ years of model building experience to work for you! V3.0 switches sides. 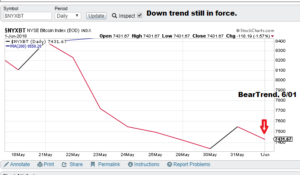 Oh oh, bear trend! 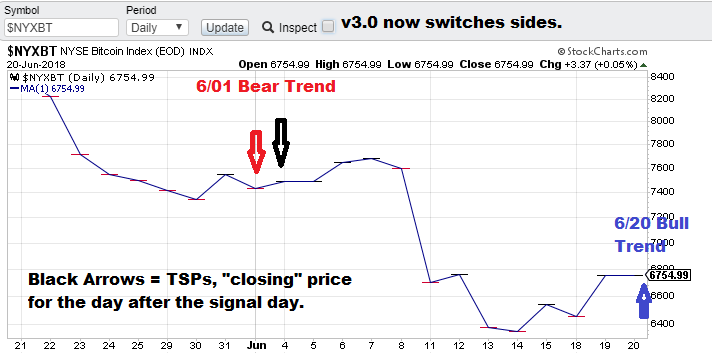 $NYXBT (Bitcoin), signals bear trend, July 16, TSP= Tuesday’s close. 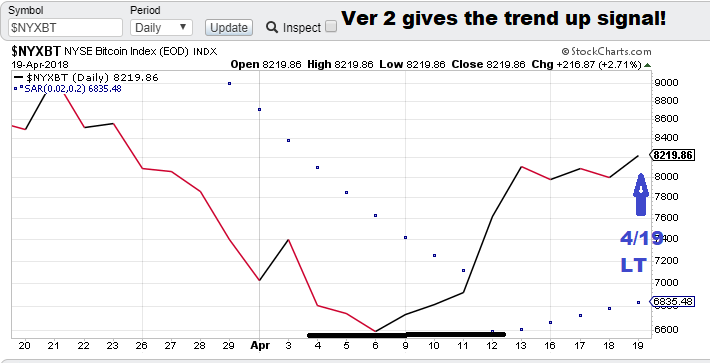 Model notes: V3.0 pushes the bear button against near-term resistance. System is behaving well. 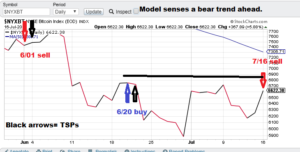 Bear Trend Signal ($NYXBT): The models are selling into near-term resistance. 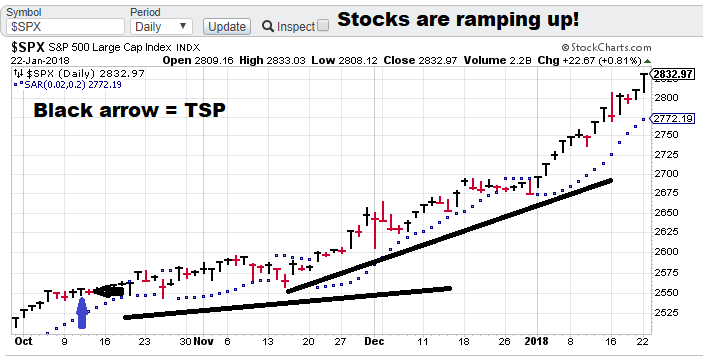 This make technical sense as the general trend over the last 5-6 weeks has been generally down. Here we go! V3.0 switches sides, turning bullish! 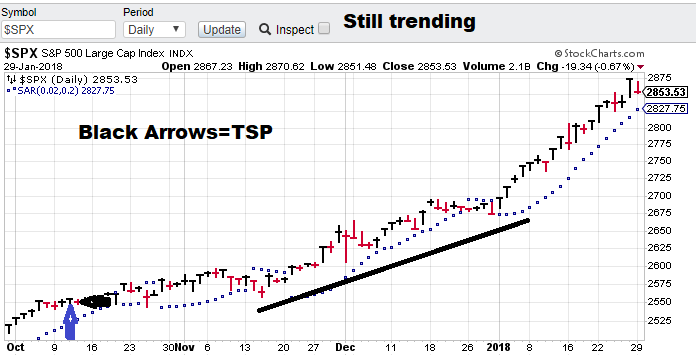 $NYXBT (Bitcoin), signals bull trend, June 20, TSP= Thursday’s close. 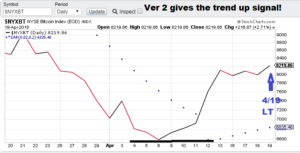 Model notes: V3.0 catches a bull trend signal after avoiding a nice drop. System is behaving well. Bull Trend Signal ($NYXBT): Bitcoin dropped to oversold levels and then rebounded some strength. 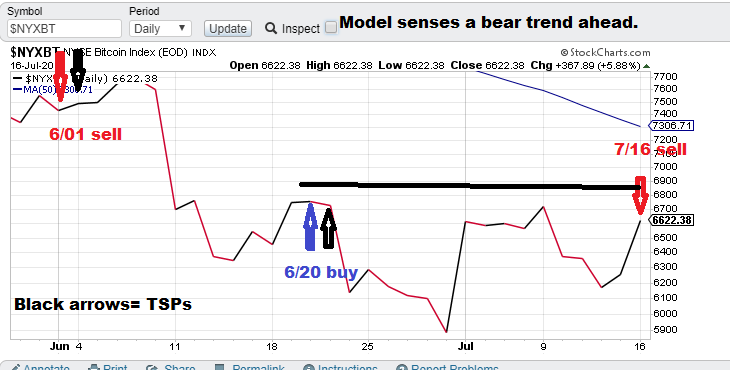 So the model bullish change does make sense when viewed through the lens of TA. We are looking for a good call here! First v3.0 signal a hit! Model notes: Yes! 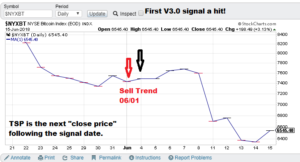 V3.0’s first signal is a hit, first a sell, then a period of low volatility and then a massive move in the direction of the signal. This is just what you want. A signal, time to act on the signal and then the signal proves out. Great time for CTM research! 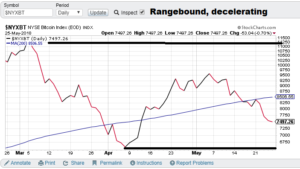 Bear Trend Signal ($NYXBT): The bear trend signal works out well with the eventual breakdown through the May 30 – June 8 trading channel. What about support? 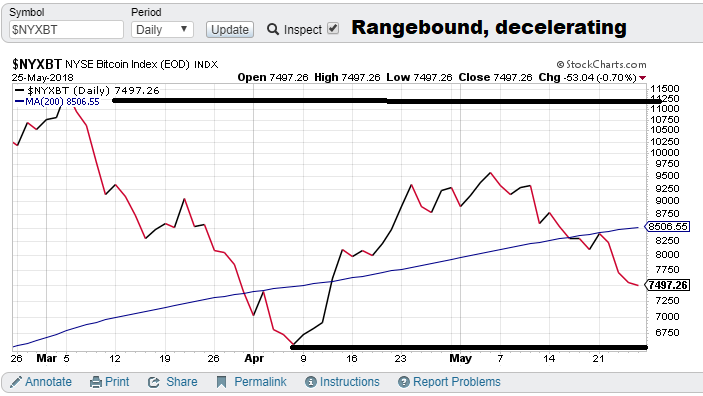 With the piercing of 6600, (approx closing low of April) there is no clear near-term support area. One can point out that we are “oversold” What about the future of Bitcoin? Follow my nonlinear mathematical predictions! Bitcoin model refit finished and issues a sell! $NYXBT (Bitcoin), signals sell, June 1. Model notes: Yikes, I expected the refresh to take at least a week longer but it didn’t. The signal came based on closing data. 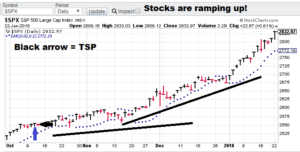 The TSP will be the close on Monday. Bitcoin is one of the strangest markets and probably the least understood. 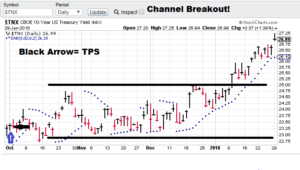 Can nonlinear analysis shed light on this exotic trading vehicle? I am looking for a great (accurate) second half of the year! Exciting stuff! 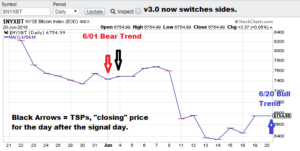 Bear Trend Signal ($NYXBT): The new model starts off with a bear trend signal. 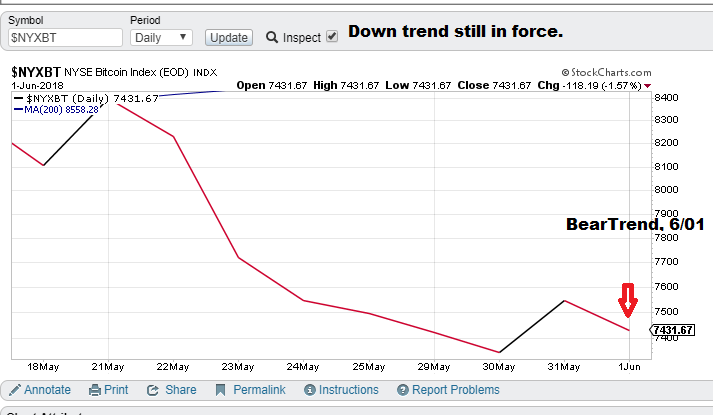 We are still above the 6700 lows and the market has not formed any kind of bottom formation. 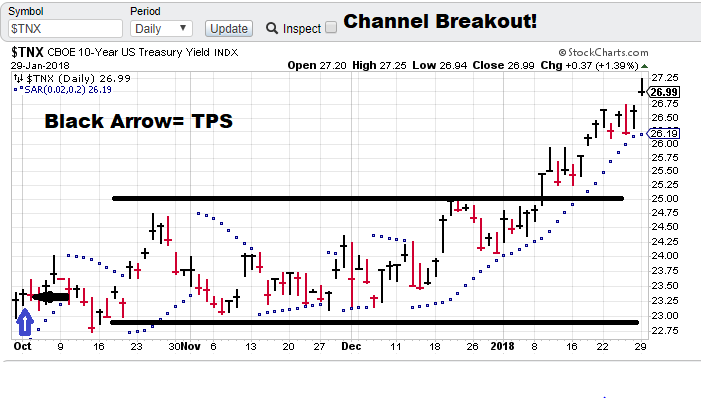 The downtrend is still in effect. 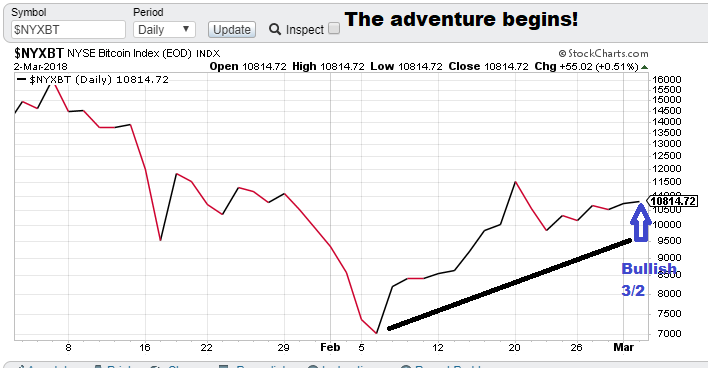 Our belief is that the nonlinear model (now v3) will give us the inside scoop when we hit the near-term support level. The current model ‘feels’ good (and stable). $NYXBT (Bitcoin), signals on hold, to return in June. Model notes: The version 2.0 is having issues (I need to rethink how one of the sub models is working), therefore I need to take it off line for more refitting. I do not anticipate this being very long, 2 weeks at the very outside. Designing trading models with sufficient power to deal with the nonlinear complexity of markets is not an easy endeavor. I believe in the work I am doing and look forward to proceeding with this. Bitcoin is one of the strangest markets and probably the least understood. 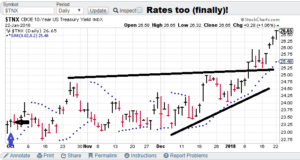 Can nonlinear analysis shed light on this exotic trading vehicle? I am looking for a great (accurate) second half of the year! Exciting stuff! 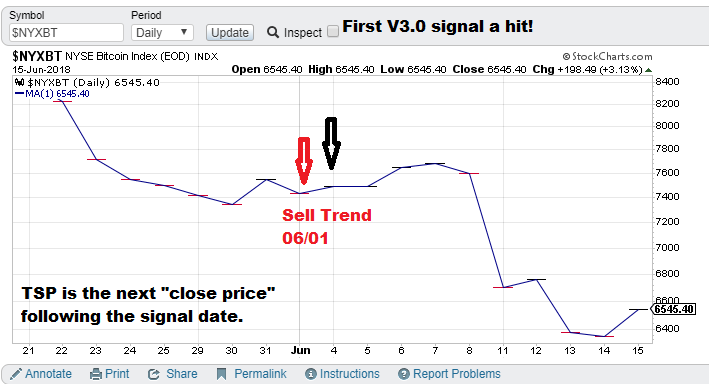 No Current Trend signal ($NYXBT): The new model is being refit. The bitcoin market near-term outlook is basically range bound but currently decelerating as it approaches the 6700 support lows. 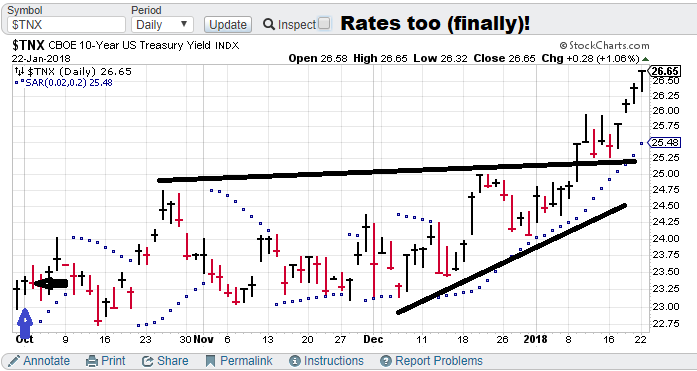 We will need nonlinear guidance to see how this will play out. Stay tuned.